The home page is a 302 (temporary-style) redirect to Airtroductions.com redirect would be better here than a 302. But a “rewrite” would be best of all, since in that case the URL wouldn’t appear to change at all upon loading the home page. Pages at airtroductions.com (without www.) 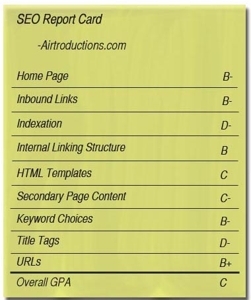 are appearing in the search indices in addition to www.airtroductions.com pages, leading to a dilution of link gain and indexation of duplicate pages. Permanent (301) redirects from airtroductions.com URLs to corresponding www.airtroductions.com URLs would be just the thing here. The News column on the right side of the home page really beefs up the page from a content standpoint, but there are some keywords I’d like to see woven into the page copy, like “business travelers”, “business travel”, and perhaps even “road warriors.” That News column is being displayed on other pages, too, besides the home page, which is content duplication. Better to have the bulk of a page’s content be unique. Currently every page indexed has the same title tag. This makes it significantly harder for the site to effectively target a range of keywords. That’s because each page has its own “song” based on the page’s keyword focus, and crafting a unique title tag for that page based on its keyword focus is essential to really make the page “sing” well to the search engines. The number of pages in Google is only 29 (as can be seen at Google.com). That’s quite low. Think of each page that’s indexed as part of your virtual sales force: More pages indexed means more selling opportunities. Opportunities abound to get many more pages indexed, without a lot of fuss. For example, every airport code search result like Airtroductions.com should be indexed, but currently the only way to these pages is through a web form. Remember, spiders can’t fill out forms. -Once these airport code pages are made available to the spiders, title tags should be optimized to containing the airport’s city, state (if applicable) and country, as well as the three-letter airport code. Some URLs include stop characters (question marks, ampersands, equals signs). However, the number of parameters seems to have been kept to a minimum (a good thing!). Nonetheless, implementing URL rewriting to eliminate the stop characters altogether would be ideal. There’s a plethora of user-generated content that’s currently hidden from the spiders: namely the member profile pages. With over 11,000 members, that amounts to over 11,000 pages that could be indexed. Of course the contact details and other sensitive pieces of information would need to be left off. Perhaps there are other types of search results pages besides the airport code pages that can be unleashed to the search engines? This could be, for example, search results by airline, or by origin/destination city pair, or by flight numbers.